Figures of Speech in Psalms: Hebrew poetry is a unique type of language that uses colourful expressions known as figures of speech to bring tenderness, richness, vividness and energy to biblical poetry. Hebrew poetry is heightened speech. It is far more compressed than prose. Prose uses sentences and paragraphs as its basic unit. Narrative uses episodes and scenes as its basic unit. 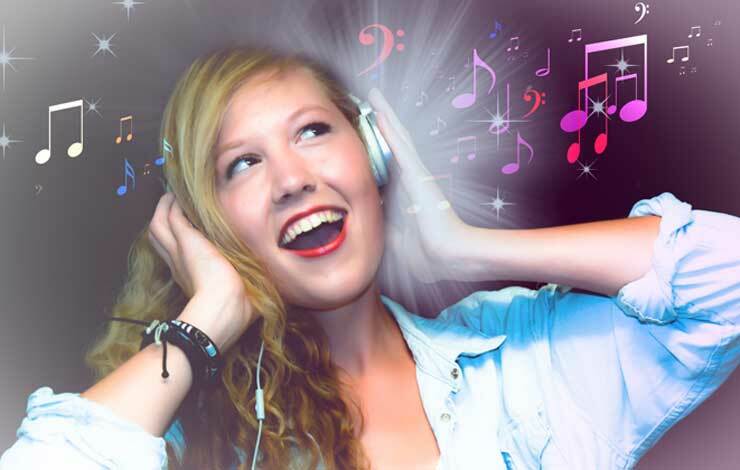 Poetry uses individual images and figures of speech as its basic unit. 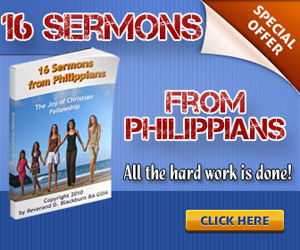 The epistles explain godliness with sentences and paragraphs. Narratives express godliness in the characters within the stories. Hebrew poetry compresses godliness into an image or picture. “He is like a tree planted by streams of water that yields its fruit in its season” (Psalm 1:3). The colourful language of Hebrew poetry draws the audience into the painted picture to bring warmth, vividness and vitality. Therefore it is important to understand imagery and figures of speech in poetry. What are they and how do they work? Below are some of the most common figures of speech used in the psalms. The simile compares two objects by using the word like or as. This is clearly seen in Psalm 1:3. We read that the wise man is like a tree planted by streams of water and in Psalm 1:5 we read that the unwise man is like chaff. The comparison of the wise man and the tree planted by the stream implies grow and prosperity. The comparison between the unwise man and the chaff implies uselessness and hopelessness. Instead of using like or as, the metaphor simply compares two objects by stating one to be like another. If Psalm 1:3 and Psalm 1:5 were examples, we could easily state that the wise man is a tree planted by streams of water and the unwise man is chaff that is blown away and perishes. The metaphor simply states one to be like the other. Another good example of the metaphor stating one to be like another is Psalm 23:1. “The Lord is my shepherd, I shall not be in want.” A simile would state that the Lord is like a shepherd. The metaphor is more intense in its statement than a simile. An allegory is a series of extended metaphors build around a central theme. There are two great examples of this in the Psalms – Psalm 80:8-16 and Psalm 23:1-4. In Psalm 23:1-4, the allegory or the extended metaphor of the shepherd and how it interacts with the sheep in ancient Israel. “The Lord is my shepherd, I shall not want. He makes me to lie down in green pastures; he leads me beside the still waters. He restores my soul; he leads me in the paths of righteousness for his name’s sake. Yea, though I walk through the valley of the shadow of death, I will fear no evil; for you are with me; your rod and your staff, they comfort me” (Psalm 23:1-4). “Create in me a pure heart, O God, and renew a steadfast spirit within me.” (Psalm 51:10). A steadfast spirit is substituted for a pure heart. The synecdoche is a literary device in which a part is made to represent the whole or the whole for the part. Psalm 24:4 is an example of how the literary device works. The hands and the heart represent the whole of one’s life. “He who has clean hands and a pure heart, who does not lift up his soul to an idol or swear by what is false” (Psalm 24:4). The hyperbole conveys a concept using a deliberate exaggeration for dramatic effect. Hyperbole does not convey literal truth but instead presents an emotional truth. Hyperbole is considered poetic license and therefore not intended to be interpreted as literal fact. “The earth trembled and quaked, and the foundations of the mountains shook; they trembled because he was angry. Smoke rose from his nostrils; consuming fire came from his mouth, burning coals blazed out of it” (Psalm 18:7-8). An apostrophe addresses a thing as if it were a person or an imaginary person as if he were present. It can be combined with personification treating a lifeless object as though it is alive. “Lift up your heads, O gates” (Psalm 24:7); Glorious things are spoken of you, O city of God” (Psalm 87:3); “Bless the Lord, O my soul” (Psalm 103:1). Anthropomorphism speaks of God as being human in that it refers to God, who is Spirit, has having eyes to see, ears to hear, tongue to speak and nose to smell. “Arise, LORD! Lift up your hand, O God. Do not forget the helpless” (Psalm 10:12). “Turn your ear to me, come quickly to my rescue; be my rock of refuge, a strong fortress to save me” (Psalm 31:2). Hebrew poetic language is very colourful and vivid. It brings energy and vitality to truths that God wishes to proclaim. An understanding of the figures of speech in psalms will help you bring the psalms alive as you proclaim them to your congregation. 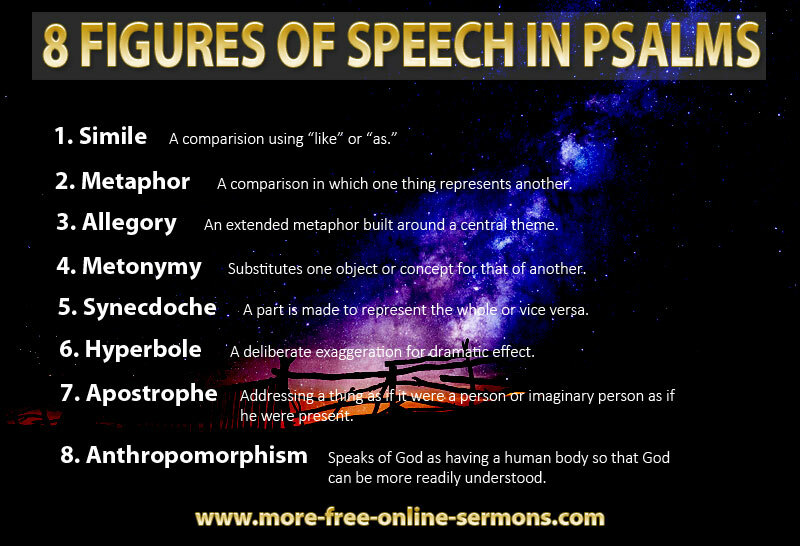 Below are some resources for figures of speech in psalms that will help you preach the psalms to your people.